I am taking a different approach to my Chelsea Flower Show coverage this year. Recent events and the amount of time I am able to spend at the show have persuaded me to devote more time to enjoying the exhibits and less time casting a critic’s eye over them. Added to which, I have the great pleasure of hosting Helen of Oz during Chelsea week, so I don’t want to spend every evening glued to my computer keyboard as I usually do. A further reason for getting slightly less swept along by the Chelsea tsunami is that in a couple of weeks I will be visiting the first ever Chatsworth Flower Show. The RHS have been gracious enough to issue me with a press pass, which means I’ll be able to take a sneak peek on the Tuesday before the show opens to the public. Chatsworth is a beautiful venue and will provide a sublime setting for a new national flower show. Hence I am saving some of my blogging energy for reporting on that exciting event. There has been much negativity in the media about the declining number of show gardens on Chelsea’s Main Avenue, down to a new low of 8 from a high of 17 last year. The dramatic downturn is attributed to sponsors tightening their belts and regulars such as The Telegraph and Laurent Perrier taking a year off. To take a contrary view, perhaps this turn of events it is not such a bad thing. In my opinion the show gardens attract disproportionate attention and detract from enormous talent of those nurserymen and women who exhibit in the Great Pavilion. Let’s enjoy a break from the excesses of the stratospheric show garden budgets and enjoy the simplicity of good plants well-grown. And there is nothing like austerity for sorting the wheat from the chaff. Let’s see what can be achieved at Chelsea with fewer pennies and a little more ingenuity. Another challenge for the RHS is the imminent departure of overall sponsor M&G Investments, with a new benefactor yet to be announced. Given the global influences displayed in this year’s garden designs, might the next sponsor be a foreign one? It would not surprise me. For their final outing as sponsor M&G have hired James Basson – he of the gardens so natural that they could be, well, natural – to create a garden inspired by an abandoned Maltese quarry. This should be a walk in the park for James Basson, who designs sustainable, no-irrigation, minimum-maintenance gardens using locally sourced plants. 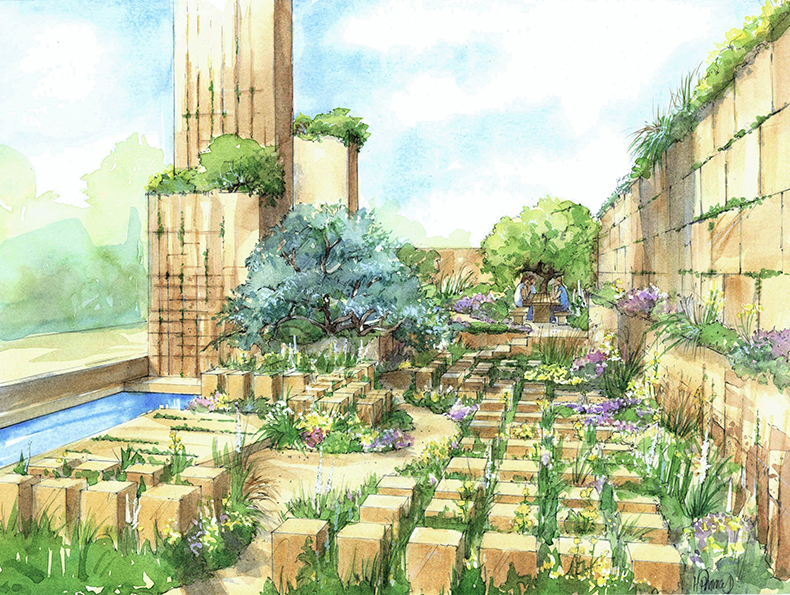 There will be monumental pillars of limestone planted with grasses, evergreens, perennials and ground cover plants unique to Malta. The rest of the plot will be divided into a series of zones, each with its own ecology, from shrubland through garrigue landscape to cliff top. A pool represents the void left behind when a stone block is quarried. If the sun comes out, bringing the golden Maltese limestone to life, there’s a real chance of James Basson achieving a matching medal, and his forth at Chelsea. With few other gardens displaying any originality, Best in Show must also be a genuine possibility. 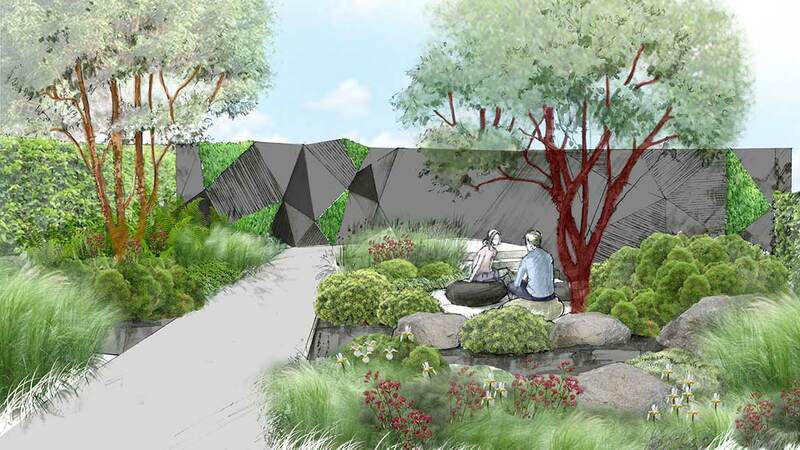 This year’s garden designs have been influenced by the landscapes of China, Japan, Canada and Mexico with only a handful drawing on the British landscape for inspiration. 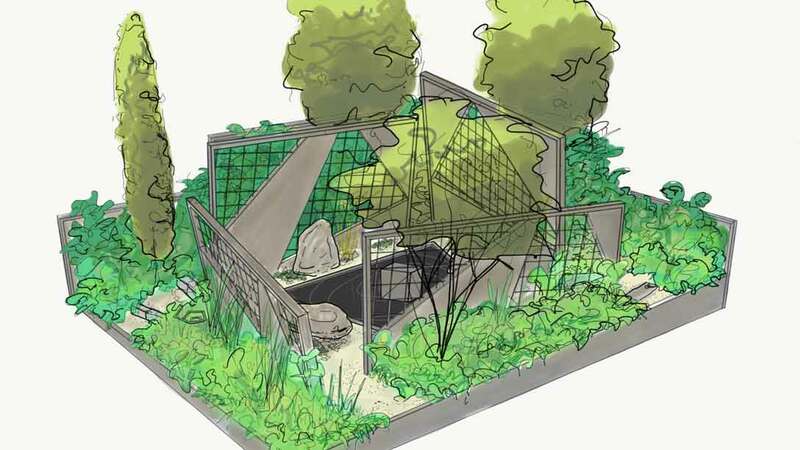 Greening Grey Britain, designed by Nigel Dunnett, aims to demonstrate how an urban garden can fulfil multiple needs, providing social space, functional storage, supporting biodiversity and harnessing excess rainfall. It promises to be a scheme from which many of us city dwellers might draw inspiration. Those who favour more traditional gardens – by which I mean those that contrast clipped box with ‘naturalistic’ multi-stemmed trees and fill the spaces in between with a blousy mix of umbels pierced through with lupins, peonies and foxgloves – will appreciate Lee Beestal’s 500 Years of Covent Garden. 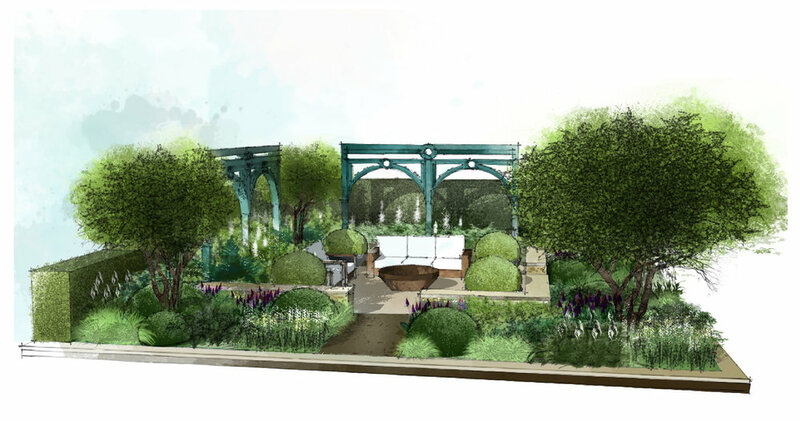 The design promises an oasis of green, anchored at each corner by an apple tree (multi-stemmed of course) and presided over by two steel arches painted to match those at Covent Garden, which are a blue-green colour. With a shaded, comfortable-looking central seating area this garden is a guaranteed crowd pleaser and will no doubt provide the setting for numerous television interviews over the coming days. Morgan Stanley have partnered with Chris Beardshaw again to produce a garden which won’t scare the horses, but which might win a gold medal. Inspired by fractal geometry and patterns found in nature, music and art this garden has similar influences to Nick Bailey’s Beauty of Mathematics garden in 2016, but offers little that’s new or original. “A sinuous path moves through three distinct garden areas, from verdant woodland to a central oak loggia and out onto a sun-drenched terrace” trills the RHS website. Haven’t we heard that somewhere before? At least three gardens have strong oriental influences. The most prominent, occupying the famous island site, is the Chengdu Silk Road Garden designed by Laurie Chetwood and Patrick Collins. This garden has the potential to dazzle, but I am rarely convinced by so much hard landscaping in a show garden. In this instance a series of rising and falling fins in shades of flesh pink and red resemble a bloodied whale carcass. This isn’t the easiest of garden features to soften with planting, although I’ve never had the opportunity to walk that particular walk. Nevertheless we are promised a showcase of some of the many garden plants familiar in the West that have their origins in China’s Sichuan Province, as well as a design that can be appreciated from every angle. 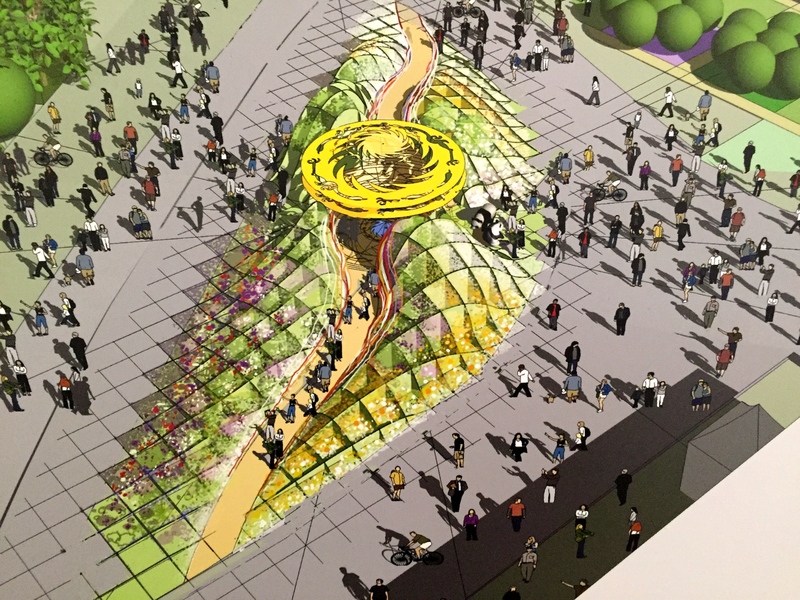 Interestingly, the original design for this garden, as presented at the RHS Early Spring Plant Fair, was strikingly different. My understanding has always been that show gardens had to stick to the design originally submitted or risk being marked down, but perhaps hard times have made the RHS more lenient. 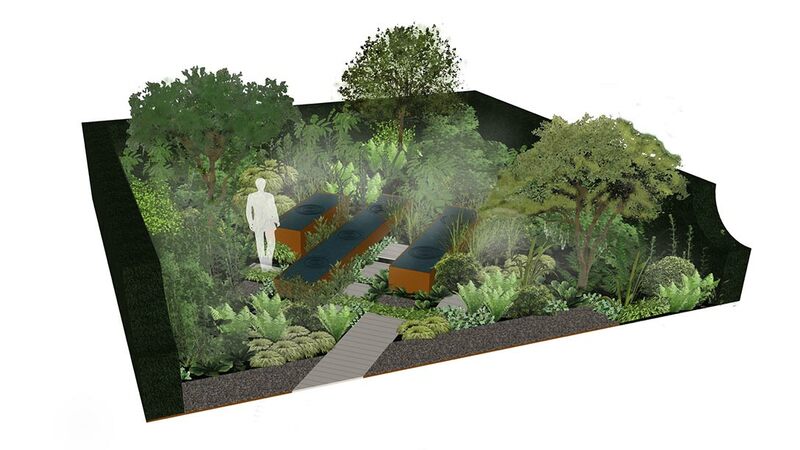 When I arrive at Chelsea on Tuesday the first garden I will make a beeline for is Kazuyuki Ishihara’s ‘Gosho No Niwa’ (No Wall, No War) which will be nestling in a shaded spot alongside the other Artisan Gardens. Mr Ishihara is a Chelsea veteran, returning for his 12th year. He speaks almost no English, but has more than mastered the art of winning gold medals at Chelsea. I suspect this year will be no exception. 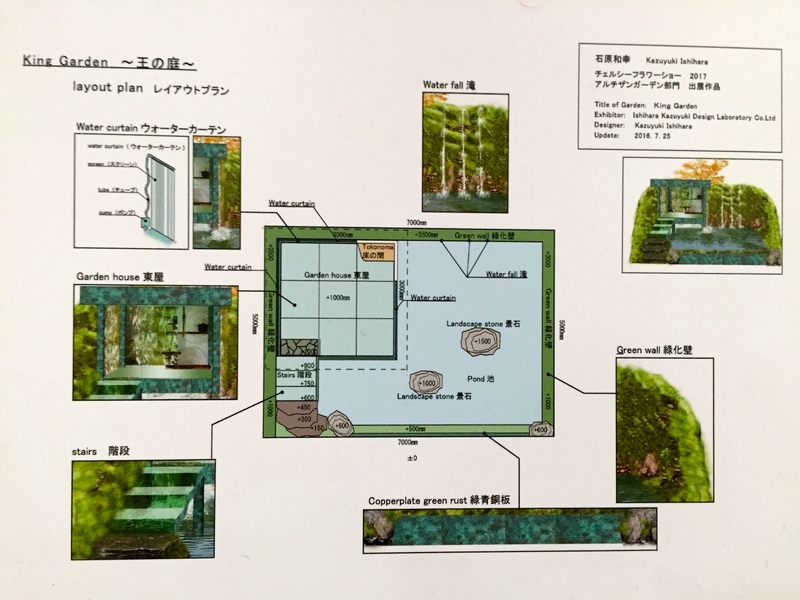 The design for Gosho no Niwa possesses all of Mr Ishihara’s usual signatures – tumbling water, colourful acers, irises, moss and dwarf pines – and will be executed with absolute precision. My money is on this winning Best Artisan Garden. In the same category, Hagakure (Hidden Leaves) designed by Shuko Noda, sets out to create a sacred and peaceful space away from the noise and stress of daily life. The colour scheme is predominantly white, a symbol of purity and sacredness in Japan. Quite what happened to the azalea-filled extravaganza that was the Seek Garden, designed by Randle Siddeley in honour of British botanist Ernest Henry Wilson, I do not know. I guess the sponsor must have pulled out at the last-minute. This is a great pity as the Seek Garden promised to flout almost every rule of modern-day Chelsea garden design by packing in hoards of rhododendrons, azaleas, camellias, viburnums and acers. This harks back to the days when these were the very plants that suburban gardeners flocked to the Royal Hospital grounds to see. I, for one, shall miss the Seek Garden that mysteriously hid. 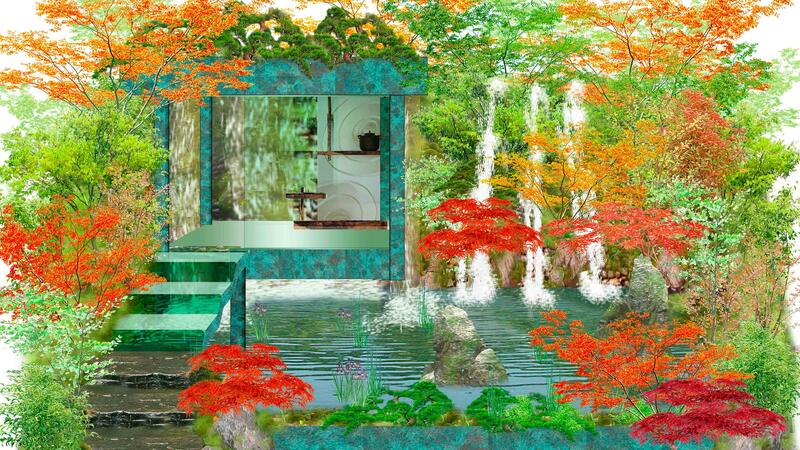 Leaving me colder than a cod in Arctic waters are gardens such as the Mind Trap Garden designed by Ian Price. OK, so the garden sets out to highlight the plight of those living with depression but, really, aren’t there more inventive ways to do so? The device of using doors / fences / barriers to denote mental or social barriers and cheery, bright plants to illustrate the end of a journey from a dark place has been done to death. This garden employs hackneyed methods which are almost as depressing as the subject in hand. More like an abandoned prison camp than an escape from mental illness? The space that’s been left vacant by hard-up sponsors has been filled with five plotsctentatively assigned to various BBC Radio 2 presenters. The Chris Evans Taste Garden has been inspired by Mary Berry (haven’t we all?) and is designed by Jon Wheatley. The Jo Whiley Scent Garden is inspired by aromas that transport us to a moment in time or a place that feels familiar, such as woodland walks, rain on warm paving, fresh earth or freshly cut flowers. 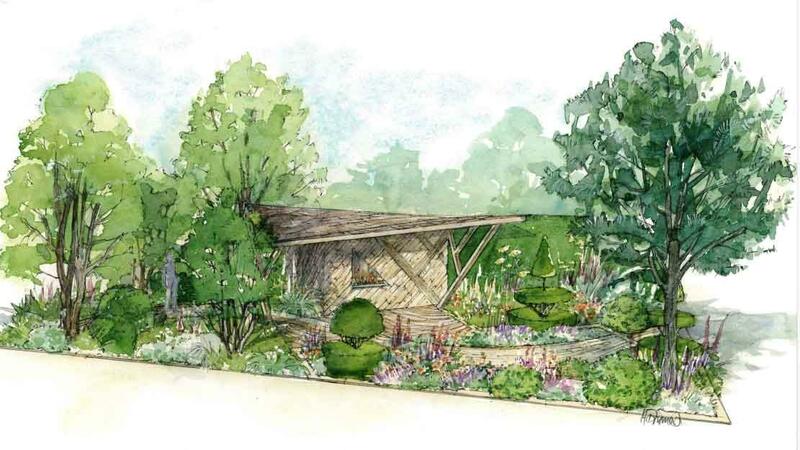 In the same odd vein, visitors will also have the chance to tune in to Zoe Ball’s Listening Garden and brush against Jeremy Vine’s Texture Garden, although it’s unlikely anyone will get their hands on any of the blooms in Anneka Rice’s Colour Cutting Garden designed by Sarah Raven. 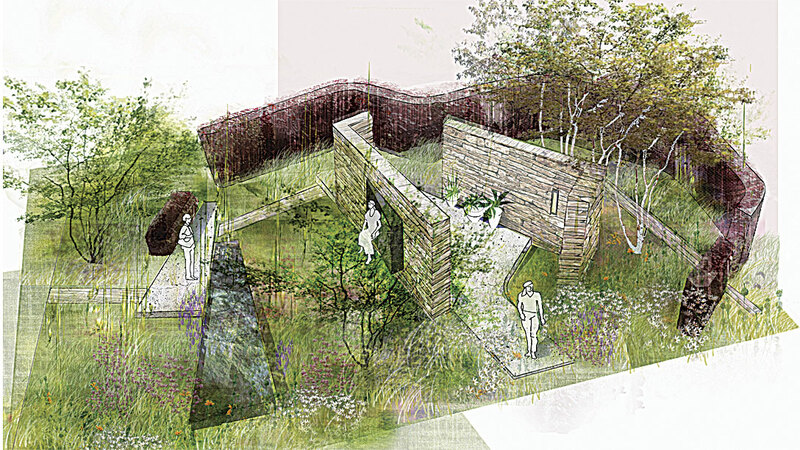 It’s commendable that the RHS have moved fast to fill the spaces left by others, but the offerings are all remarkably similar to superior gardens that have gone before, expecially the designs by James Alexander Sinclair (Zoe Ball’s Listening Garden) and Matt Keightley (Jeremy Vine’s Texture Garden), below. In summary, and it pains me to say so, I am not expecting 2017 to be a vintage Chelsea Flower Show, particularly after the splendid highs of 2016. A low show garden count, a dearth of new talent and extreme lack of originality has set my expectation levels pretty low. I very much hope my pessimism might be proven ill-founded and that I will find solace, as I always do, in the Great Pavilion, where high standards rarely falter. 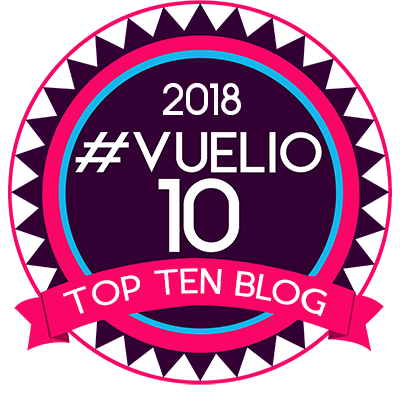 Come back throughout this week to find out if I hit the nail on the head or have had to eat my hat as I report on the good, bad and indifferent from Chelsea 2017. TFG. Taking photos is the easy part, it’s the writing up that takes the time. Just watched weather forecast. Set fair all week. You are SO jammy (=lucky)!!! Thank you for post, really informative as no ticket for the real thing. Will follow you avidly, so happy to have been introduced to your blog, love it. Have fun. That’s brilliant Carol, thank you for checking in. I will be taking a slightly more relaxed approach to Chelsea this year, but will still be posting plenty of photos over the next few days. *whispers* im working on the Mindtrap garden on sell off day, proceeds to help support Perennial and an irsh mental health charity…. Ill get me coat… taxi! Happy to hear proceeds will go to such good causes. Sorry the garden didn’t quite do it for me on paper. Perhaps it will be more engaging in real life. Hope you get time to snap up some bargains yourself. I hope the sun shines for you, Dan. Or there will be trouble! so beautiful! always love the show!